For a long while you didn't have a lot of choices when it came to calendars. There were those given out as freebies by businesses and the ones featuring racy pictures of women that seem to hang in garages in every Stephen King novel. Then Ziggy changed everything, bringing a smorgasbord of options to desk and wall calendars. He's always been a trailblazer. Well, calendars are about to take another giant leap forward in England. 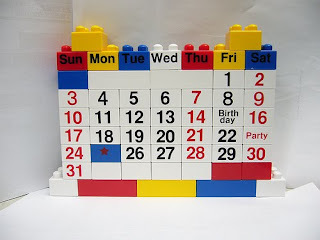 A LEGO Charity Calendar is being released for 2010 showing minifigures in precariously stated photographs that are connected to the theme or holiday of a given month. The slowly thawing LEGO minifig scaring the Arctic Explorers minifig is well done. As long as you're at the LEGO Shop, you might also ask about the LEGO company making the Pirates Advent Calendar available in the United States and Canada. Right now, you can only get it if you live abroad.